Five undergraduate researchers at Bond LSC were awarded arts and sciences scholarships to help them continue their education. Congratulations to each of the winners. 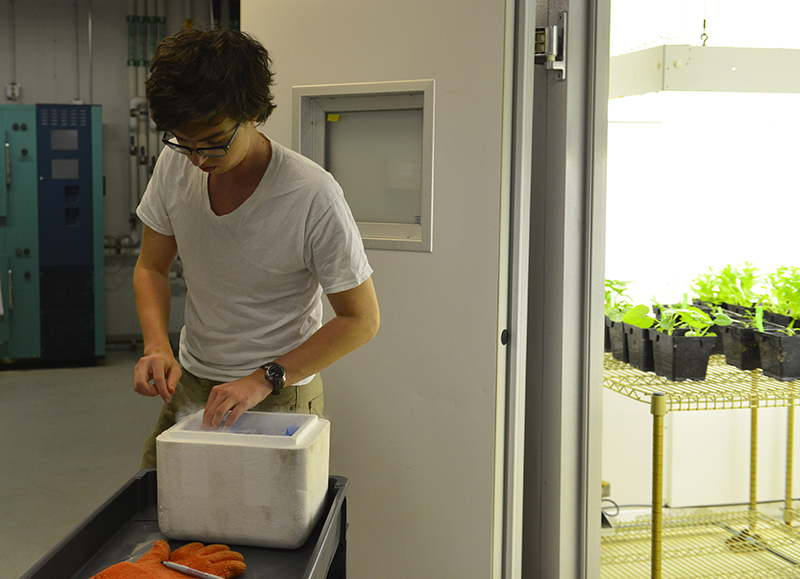 MU undergraduate Wade Dismukes gathers plants from a growing room in Bond LSC to prepare for an experiment about plant evolution on Thursday, April 9, 2015. Dismukes, who won an arts and sciences scholarship, is a researcher in Dr. Chris Pires’ lab. “I got into science because I had good mentors,” he said. Wade Dismukes started his career as an undergraduate researcher at Bond LSC in Dr. Jack Schultz’s lab almost four years ago. He started out studying how plants, specifically grape vines, reacted to being eaten by insects, specifically phylloxera. About two years ago, he joined Dr. Chris Pires’ lab in order to learn to read a transcriptome, which is a way of looking at all the genes an organism expresses, Dismukes said. A senior with one year of school left, Dismukes is double majoring in math and biology. He plans to go to graduate school and eventually become a research scientist. He’ll stick to plant science, he said. Dismukes credits his interest in science to good mentors. MU junior Nathan Coffey works in Dr. 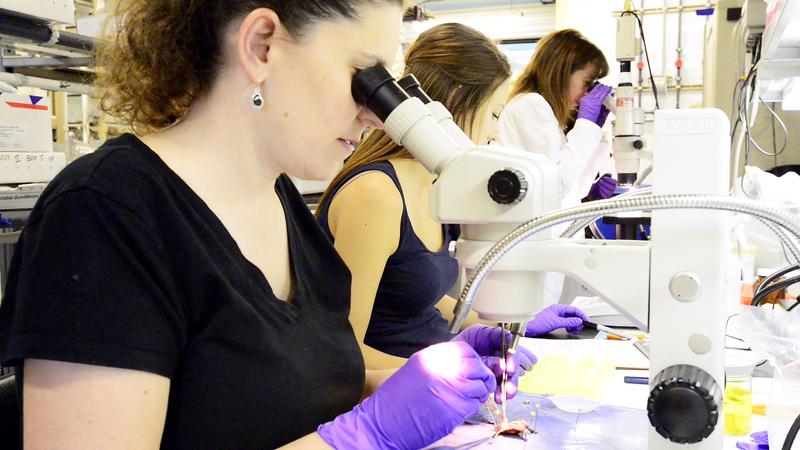 Dawn Cornelison’s lab on an experiment involving muscle tissue on Thursday, April 9, 2015. Coffey, a winner of an arts and sciences scholarship, said his research focuses on how different types of muscle work within the body. He said that he hopes to complete an MDPhD one day so he can be a researcher and physician. This summer, he will intern at the National Institute on Alcohol Abuse and Alcoholism (NIAAA), which is part of the National Institutes of Health (NIH), in Bethesda, Md. MU junior Nathan Coffey thought he would study physical therapy. Then, he tore his ACL playing soccer. He became interested in medicine and switched majors to biological sciences. 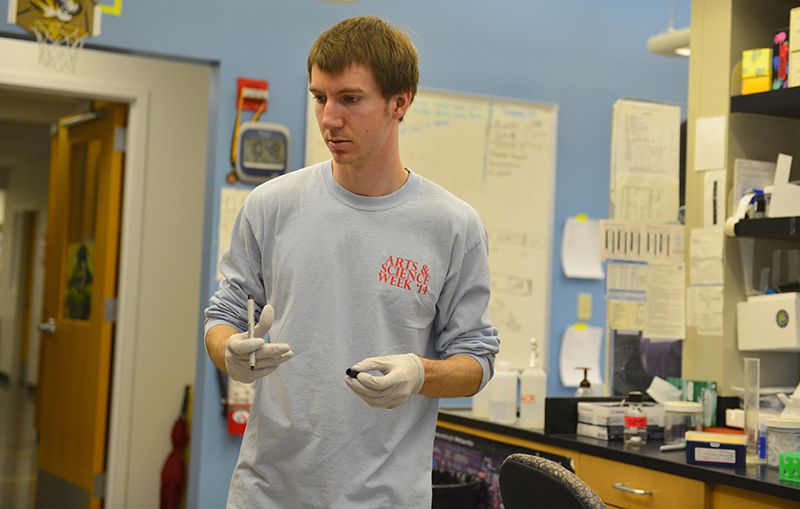 He has been an undergraduate researcher in Dr. D. Cornelison’s lab since his sophomore year. This summer, he will intern at the National Institute of Alcohol Abuse and Alcoholism in Bethesda, Md., where he will work on a research project. 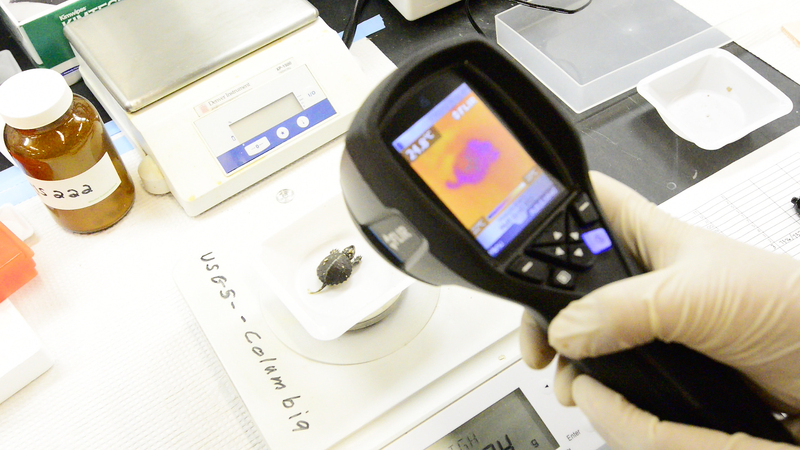 Currently, he researchers how different types of muscle work within the human body. Coffey says he would like to pursue an MDPhD so he can become a research physician once he finishes his bachelor’s degree. MU junior Kevin Bird inspects plants in a greenhouse on Monday, Feb. 23, 2015. 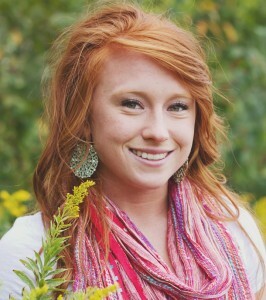 Bird, who won an arts and science scholarship, is a student in Dr. Chris Pires’ lab studying how plants express genes. MU junior Kevin Bird said a heart defect he was born with made him interested in genetics from a young age. 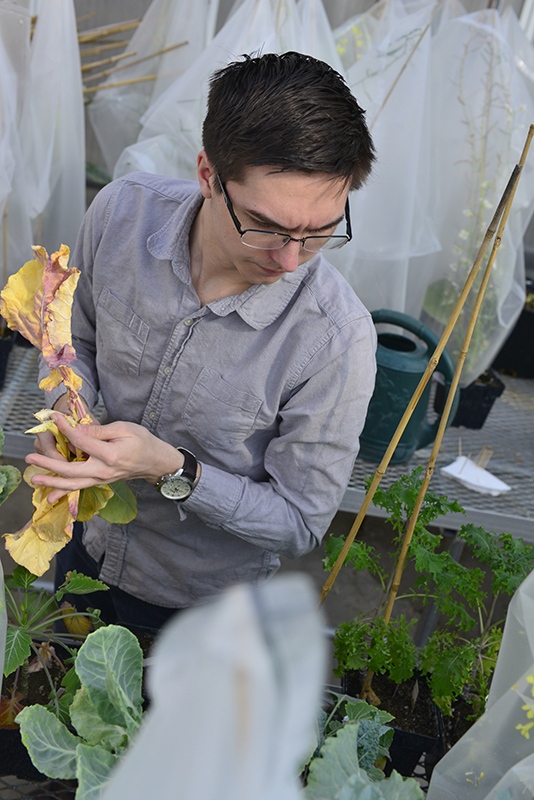 Now, the biology and philosophy major works in Dr. Chris Pires’ lab to understand the genetics behind why Brassica rapa — a species that include napa cabbage, mizuna, turnips, bok choy and field mustard — is nutritious. 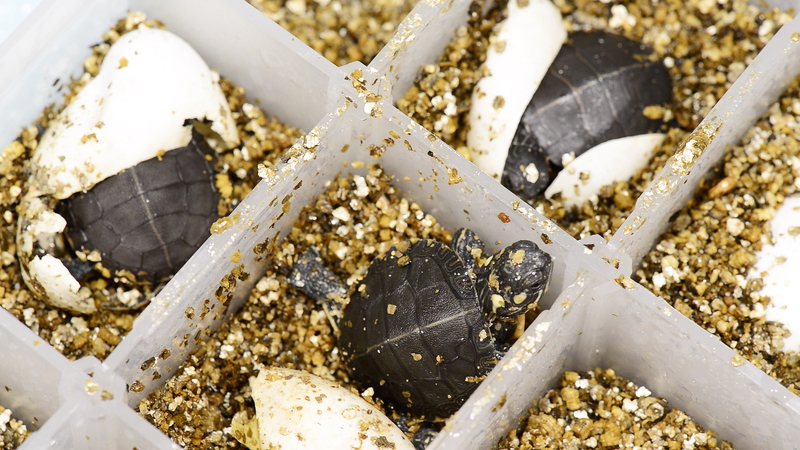 He uses genomics and quantitative genetics to conduct his research. 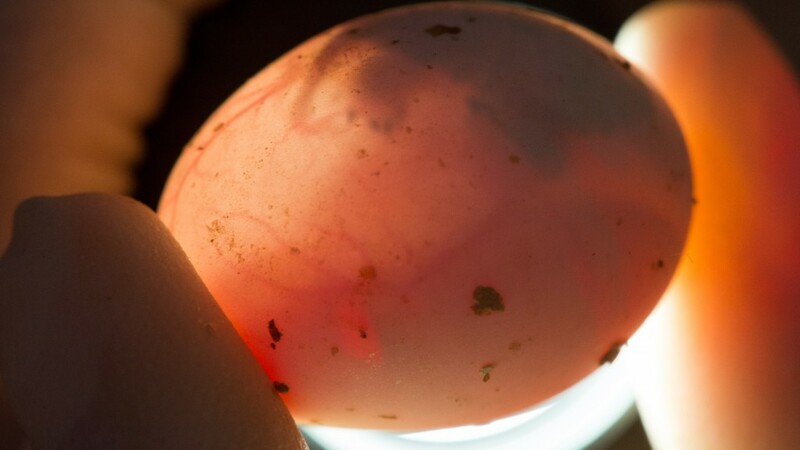 Bird said he wants to continue to study plant genetics in a doctoral program and eventually become a professor so he can teach and research plant molecular evolution and systems biology. MU sophomore Morgan Seibert is a researcher in Dr. D. Cornelison’s lab at Bond LSC. She is a winner of an arts and sciences scholarship. Morgan Seibert has been interested in science since she was kid, farming with her father. The Mu sophomore currently studies rhabdomyosarcoma, the type of skeletal muscle cancer that occurs most often in children, alongside Dr. D. Cornelison and a graduate student. Seibert plans to continue researching independently throughout the summer and fall. Her research in the coming months will focus on the role of receptors known as Ephs and ephrins in the nuclei of cancer cells. The research may lead to new treatments for cancer. Seibert said she hopes to either go to medical school or continue her research in graduate school. MU undergraduate Badr Almadi, a researcher in Dr. Anand Chandrasekhar’s lab could not be reached for an interview or photograph. He is also a winner of an arts and sciences scholarship. A simple virtue lies at the heart of Xuemin (Sam) Wang’s research: thrift. “A good way to think of it is how to increase output without demanding more inputs,” Wang said. 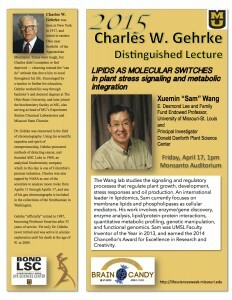 Wang, the E. Desmond Lee and Family Fund endowed professor at the University of Missouri-St. Louis and a principal investigator at the Donald Danforth Plant Science Center, studies plant membrane lipids. His lab is focused on understanding the relationship between oil production and plant stresses such as drought and nutrient deficiency. Wang will speak during the 31st annual Missouri Life Sciences Week, a yearly celebration of MU’s research and an exploration of public policy, entrepreneurship and science outreach. Wang’s lab uses Arabidopsis, the lab mouse of the plant world, as a discovery tool but also works with crops such as soybean and the Camelina species. Camelina was widely grown in Europe before it was supplanted by canola, but Wang and others are working to develop Camelina as a productive oil crop. The lab studies how lipids — the fatty acids that make up cell membranes — help regulate cell function. For example, they’re trying to figure out how a cell senses water and nutrients and then “determines whether it should grow faster or store more lipid or carbohydrates,” Wang said. By understanding those processes, future research might develop plants that do more with less. That could mean less water and chemical fertilizer needed for the same or greater yield. Wang pointed to reliance on fertilizers as a major problem. Ultimately, Wang’s research could improve plant oil and biomass production while decreasing our dependence on fertilizers and abundant water. 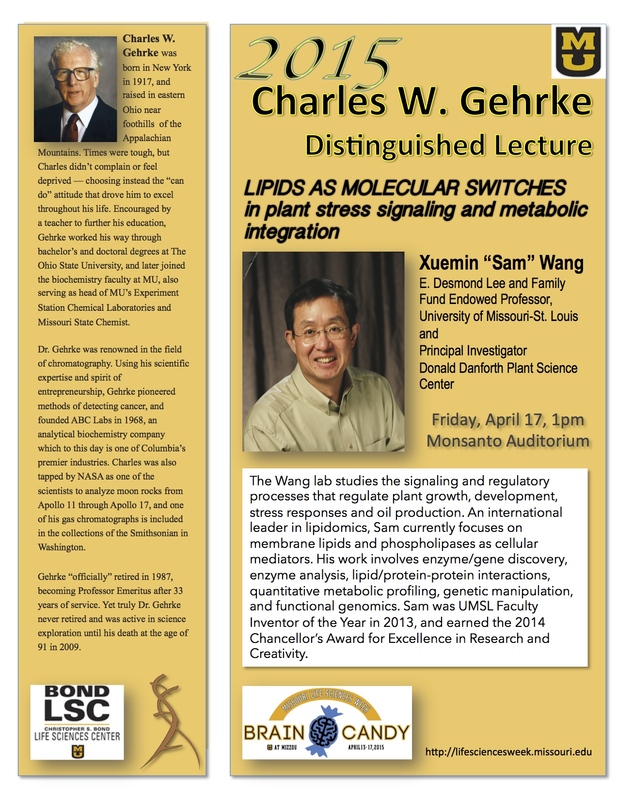 Wang’s presentation on “Lipids as Molecular Switches in plant stress signaling and metabolic integration” constitutes this year’s Charles W. Gehrke distinguished lecture. Gehrke, a MU professor of Biochemistry who died in 2009, was instrumental in advancing the field of chromatography and helped analyze rock samples retrieved from the moon during the Apollo 11 mission. Gehrke grew up in poverty during the great depression and worked in melon fields during his youth before studying at Ohio State University. Missouri Life Sciences Week is an annual event. In addition to Wang’s talk, this year’s line-up will also focus on HIV and emerging diseases and highlight more than 300 undergraduate and graduate research projects at its poster sessions.